Realautotips. - Maybe it is will be special information for us that very nice with new motor sport from Honda. 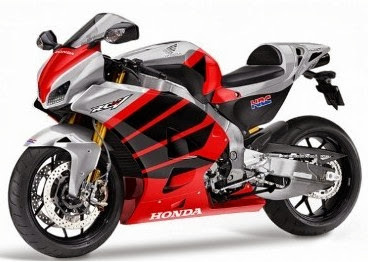 It is because that Honda motor reported will show the new sport Honda motor RCV 1000 MotoGP Replica at 2013 EICMA motor show in Milan, Italy that will be deployed in November. Although rumored that New Sport Honda Motor RCV 1000 MotoGP planned only for motor racing team, but this motor will also be released in general user with fantastic price with more than 100.000 Euro. With the expensive price, Honda will provide the motor with the rumored specs are pretty close to that used by motorcycle RC123V Pedrosa in MotoGP and Marquez. The engine will likely use a V4 configuration is designed based on the prototype MotoGP machine. The machine is able to offer strength to over 200 hp. But despite the high-powered, electronic systems and character of this bike is designed so that the motor can comfortably use on the road. Once introduced, the new possibilities this bike on sale in 2015.